Data sources power the visualizations on your dashboard. They connect your chosen files, databases, applications and services to Klipfolio. To get the most out of Klipfolio, think about what source you want to get data from, what subset of data you want to bring in from that service, and how you want to visualize that data. With this knowledge, you can connect to and model your data. You can choose pre-built Klips from the Klip Gallery and pre-built dashboards from the Dashboard Gallery or you can build your own bar charts, tables, gauges, and many more visualizations in the Klip Editor. No matter what approach you take, you will need to set up data sources first. Behind every visualization on your dashboard, there is a data source. What data sources are supported by Klipfolio? What do your data sources look like in Klipfolio? How do I connect my data in Klipfolio? I have my data - what's next? Klipfolio enables you to quickly integrate your data from a number of popular services by using pre-built connectors, which aggregate your data based on specific parameters, or by creating your own custom connectors. But why stop there? Our flexible platform allows customers to connect to data sources for which we do not yet have built-in connectors and even upload your own files. For more details, see the Knowledge Base article What data sources does Klipfolio connect to? SQL Databases, such as MySQL, PosgreSQL and Amazon Aurora. You can find a list of all your data sources by clicking Data Sources on the left-side navigation. Klipfolio retrieves data in two formats: tree-structured data, such as JSON or XML, and tabular data, such as CSV. Once your data is in Klipfolio, you have the option of modelling it to organize the structure of your data before using the data source to build a Klip. See the format types below to learn more. Note: If you are using the Klip Gallery or the Dashboard Gallery, or data source templates you won't see any raw data unless you make changes to your Klip. In tree-structured data, you navigate through the data in an expand and collapse format, typically a JSON or XML file type. 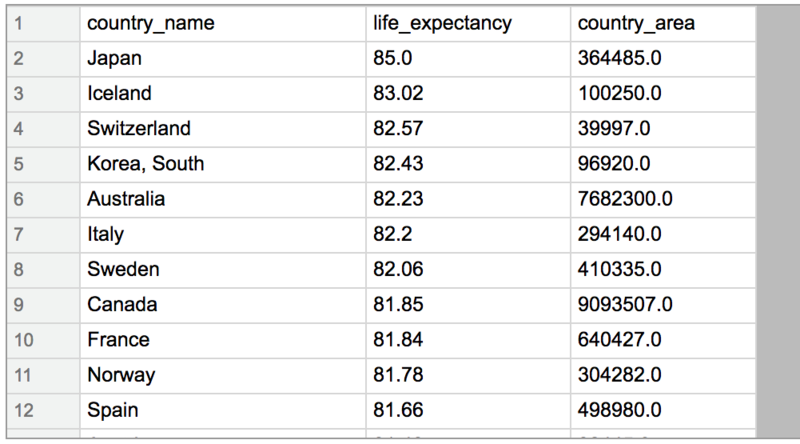 Tabular data is broken down into columns and rows, typically a CSV or Excel file type. After data is brought into Klipfolio in one of the formats above, you have the option to model your data source. This enables you to simplify and restructure your data before building a Klip. Modelled data sources only need to be updated in one place to update all Klips using that data source. Note: Some service connectors give you the option to choose whether you want to retrieve data in tabular or tree-structured format. For example, the Salesforce connector lets you choose between JSON and CSV format. Whether you are connecting a pre-built Klip or dashboard, building a Klip from scratch, or adding to your list of data sources to build Klips later, connecting your data to Klipfolio is quick and easy. You can connect your data directly on your dashboard when you add Klips from the Klip Gallery or dashboards from the Dashboard Gallery. When you make your selection - whether it’s a pre-built Klip or pre-built dashboard - it is automatically added to your dashboard in sample data mode. Your next step is to connect your own unique data. Click Connect Your Data at the top of your dashboard and follow the prompts to update all Klips currently in sample data mode on your dashboard. Click on the Sample Data banner on a Klip and follow the prompts to update that one individual Klip. Note: When you hover over the Sample Data banner, it says Connect Your Data. Your pre-built Klips are already connected to a data source. You built a Klip in the Klip Editor, in which case you can click Edit... in the three-dot menu to connect your data from the Klip Editor. 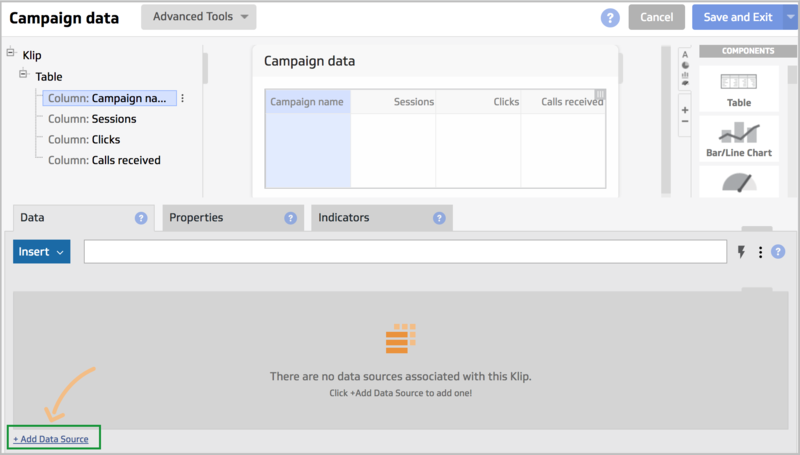 If you are ready to start building Klips, and you know what data you want to display and what visualization type (component) you want to use, you can connect your data directly in the Klip Editor. 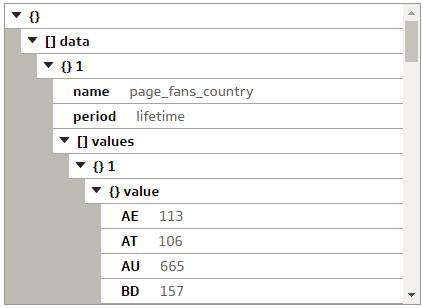 At the bottom of the page in the Data tab, click +Add Data Source. In the Add a Data Source popup window, either select a data source you have already created or click Create a New Data Source. On the Select a Connector page, either find your Service Connector in the list, or choose a generic Core Connector. Follow the prompts to set up your connection (this process will be different for each service). Use the help of the Klipfolio data source documentation and any support information provided by the service you are connecting to, for example their API documentation. Follow the prompts to set up your connection (this process will be different for each service). Your new data source is added to your list of data sources. Use the help of Klipfolio data source documentation and any support information provided by the service you are connecting to, for example their API documentation. After you’ve connected to your data, you have the option of modelling your data source by clicking New modelled data source on the About this Data Source page.